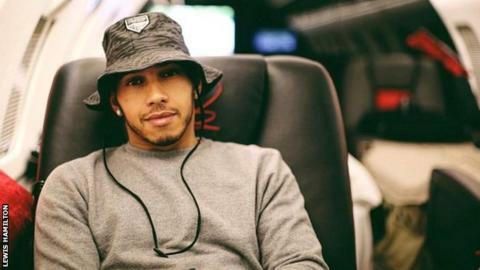 Lewis Hamilton said "nobody was hurt" in the accident "but the car was damaged"
Triple world champion Lewis Hamilton was involved in a minor road accident in Monaco on Monday. The 30-year-old said he made "very light contact" with a stationary vehicle but that no-one was hurt. Hamilton had delayed his flight to this weekend's Brazilian Grand Prix until Wednesday on medical advice as he has been suffering with a fever. The Mercedes driver wrote on Instagram: "I am feeling better and I'm currently boarding the plane to Brazil." Hamilton will arrive a day later than planned for the penultimate race of the season. Explaining the accident, he added: "Whilst ultimately, it is nobody's business, there are people knowing my position that will try to take advantage of the situation and make a quick buck. No problem. "Nobody was hurt, which is the most important thing. But the car was obviously damaged and I made very light contact with a stationary vehicle. "I am informing you because I feel we all must take responsibility for our actions. Mistakes happen to us all but what's important is that we learn from them and grow. Can't wait for the weekend Brazil." Hamilton, who has never won at Interlagos, clinched his third Formula 1 World Championship at the United States Grand Prix last month. However, he finished second behind team-mate Nico Rosberg at the Mexican Grand Prix on 1 November. Have Honda found answer to engine woes? Read more on Have Honda found answer to engine woes?